Landing in this field didn't happen by accident. I grew up in middle class America and watched my parents work hard but lack the guidance needed to secure a comfortable retirement. Having a passion for investing and realizing that retirement for them would be different than expected, I made a decision to become a Wealth Advisor. I have a desire to help others along their journey to retirement in hopes of helping them avoid the challenges that my parents face. I am committed to helping individuals and families understand the importance of financial security and create strategies for their retirement assets. I work closely with my clients to evaluate opportunities and navigate the current economic environment. I currently reside in Salt Lake City, Utah with my wife and two children. 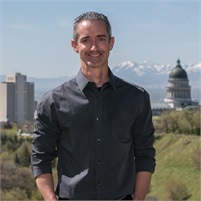 Growing up in the Wasatch Front gave me an appreciation for the outdoors and the recreation opportunities in my backyard, the Wasatch Mountains. I clear my mind and reduce stress on my mountain bike in the summer, on my snowboard in the winter & with my guitar year round. I find myself extremely fortunate to be surrounded by a wonderful support group filled with family, friends and clients. I love spending time with my family, traveling and exploring the great outdoors.